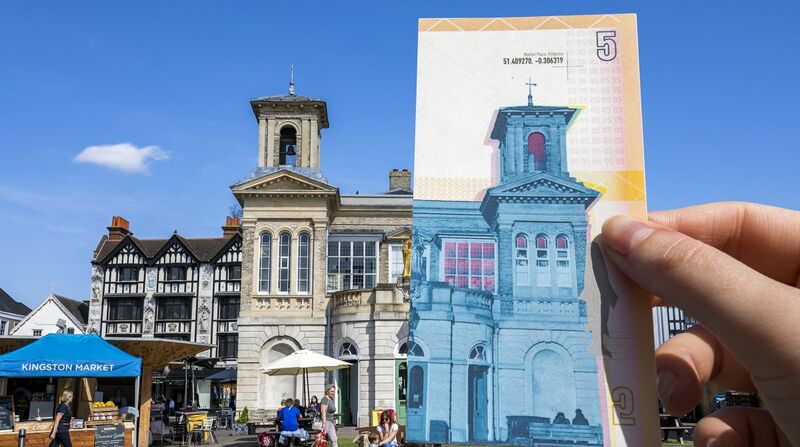 Two graphic design students from Kingston School of Art have showcased the vibrancy, diversity and history of Kingston upon Thames in new designs for local currency the Kingston Pound. The soon-to-be released notes are designed to encourage interactions on social media and spark interest in visiting locations across the London borough. Chosen by design experts, local business people and University alumni, Molly Dunne and Ella Hilton's bank notes are each adorned with an image of a Kingston landmark - the history-laden Market House Building, art-deco styled Surbiton train station, New Malden's iconic fountain and the sixties-built Tolworth Tower. The eye-catching currency comes in four denominations - £1, £5, £10 and £20 - that contain an ingenuous way shoppers can interact with them. Only half of each landmark is printed on the notes, individuals can complete the picture by holding the notes up and aligning them against the real-life features before taking a snap on their phone. The design even includes heat reactive ink showing how to hold the note to achieve the optimal image. 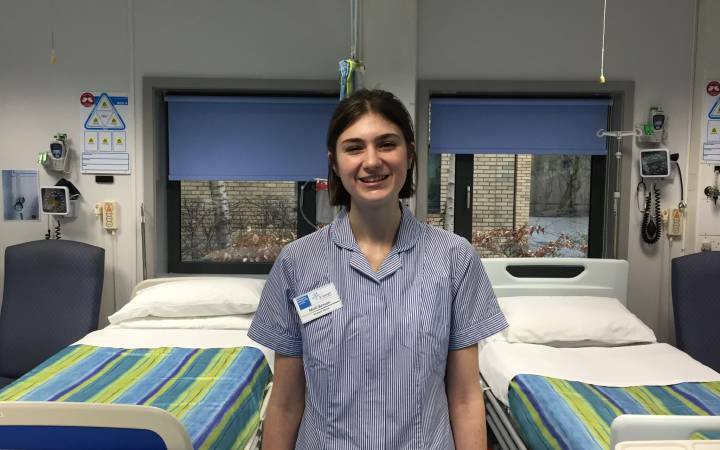 "The idea behind it was to create an online buzz, a little treasure hunt around the borough which would mean visitors and tourists could take home a memento of their visit to Kingston even if they had spent the money," Ella, 22, from Heathfield, East Sussex explained. The notes were created with social media interactions and shareable content at the heart of the design. 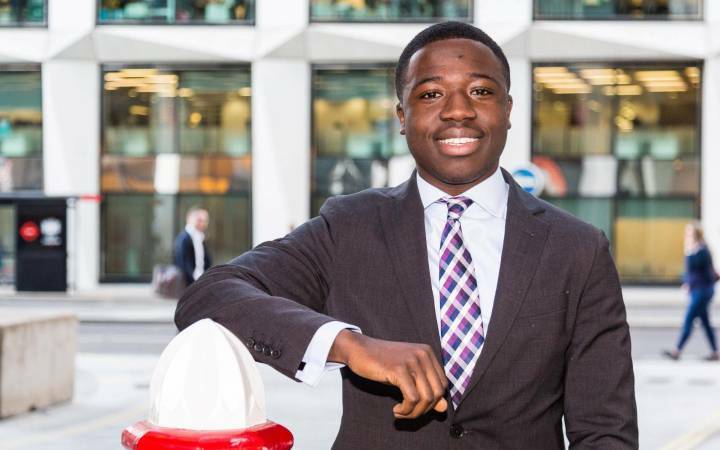 "We were concerned that young people don't often use physical currency, preferring contactless payments and apps on their phones," Molly added. "We wanted to change their perceptions and use the notes to create a more impactful experience - to capture a moment in the user's lives," the 23 year old from Galway, Ireland said. 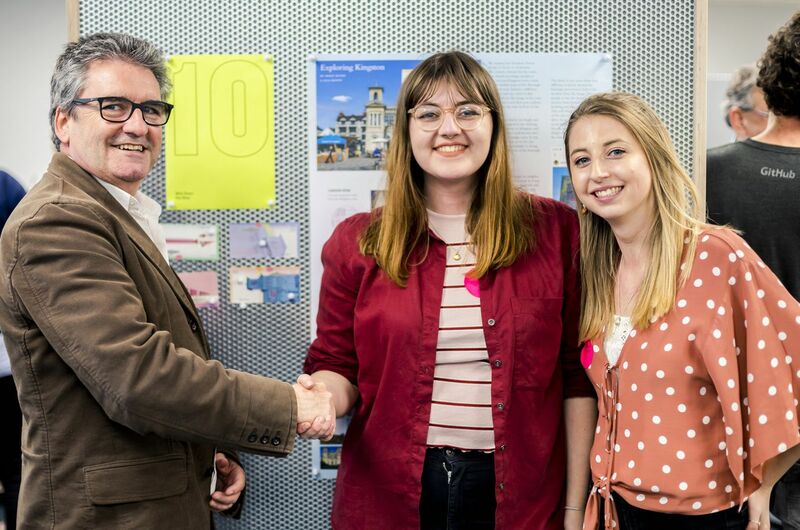 Co-founder of the Kingston Pound, Andrew Connolly, congratulates winning designers Molly Dunne and Ella Hilton. Some of the intricate design details slowly reveal themselves upon careful inspection. Among these are an intricate pattern mirroring the waves on the Kingston crest, the co-ordinates of the location shown on the note and fluorescent microtext listing the names of contributors to the Kingston Pound project. There were also more technical features the students needed to incorporate in to their proposals. "We have tried to make our design as complex as possible to ensure the notes can't be forged," Ella said. "All of these small details were considered and each one has a relevance to the borough - we wanted to include as many elements of Kingston's identity as we could." 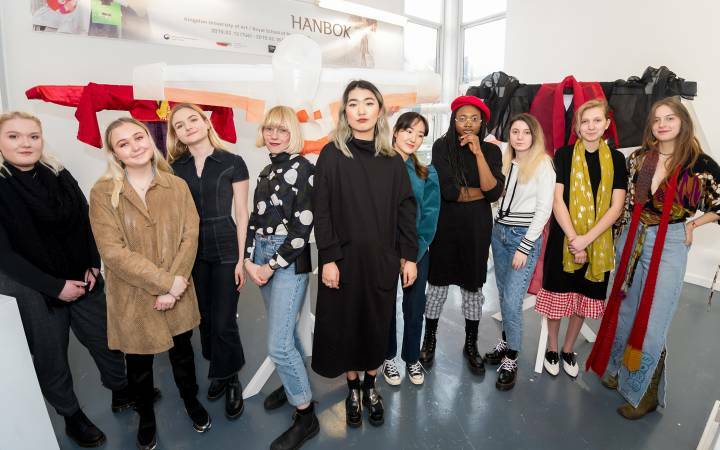 Associate professor and graphic design degree course leader Rose Gridneff said the project gave the students the chance to work in a field many established designers would love to be involved in. "It was a dream design brief - the project will have a lasting legacy with the notes hopefully being passed around Kingston for many years to come," she said. Ms Gridneff said she and fellow project lead Kieran O'Connor had championed experimentation within the short timescale of the brief. "Today's designers are used to seeing everything through a computer screen - in this project it was important the students came up with proposals people would want to touch and interact with," Ms Gridneff said. "Molly and Ella's clever design is vibrant and tactile - breathing new life in to paper currency and reflecting the whole of Kingston." 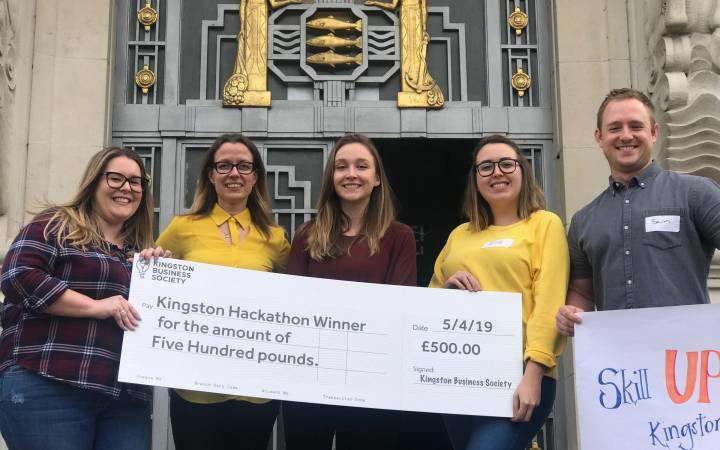 Following the lead of such similar successful ventures as the Bristol Pound and Brixton Pound, the idea for a Kingston Pound was first discussed nearly five years ago. The aim of the currency is to guarantee more of the money spent in Kingston upon Thames remains in the borough - leading to greater investment in the local economy. Andrew Connolly, one of the founders of the Kingston Pound, said the judges were impressed by the design and the professionalism of the students. "They had developed their ideas in to bank notes as good as any currency currently in circulation worldwide," he said. "The notes will attract people who haven't seen the Kingston Pound before and as they use them they will start to notice the design detail which will hopefully become a talking point. The process then becomes more of a social transaction rather than just a monetary exchange." The notes feature a range of small details designed to be discovered over time. •	Find out more about studying Graphic Design BA(Hons) at Kingston University.